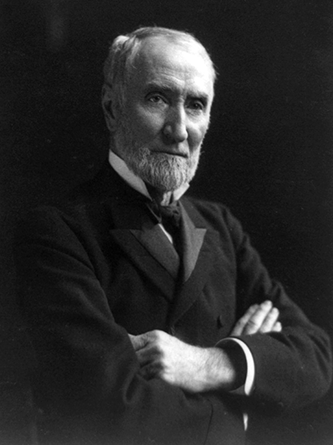 Today in Masonic History Joseph Gurney Cannon passes away in 1926. Joseph Gurney Cannon was an American politician. Cannon was born on May 7th, 1836 in Guilford County, North Carolina. At the age of 4 his family moved to Annapolis, Indiana. When he was fifteen his father, who was a doctor, drowned while swimming across a river to reach a patient. Cannon took over the family farm. When Cannon was asked by a local attorney to testify in a slander case, he became fascinated with the law. He read law with the lawyer who asked him to testify and attended one semester at the University of Cincinnati law school. In 1858 he was admitted to the bar. Unfortunately life was not good as an Attorney in Indiana. So Cannon went to Illinois and ended up living in Tuscola, Illinois. It was an accident that Cannon ended up in Tuscola, he had run out of money and boarded a train to Chicago. When the conductor found out that he had no ticket he was put off the train in Tuscola. During the 1858 debates, Cannon became a fan of future President Abraham Lincoln. When Lincoln was elected president in 1860, Cannon was appointed as a regional prosecutor. In 1873, Cannon began a long stay in the United States House of Representatives. He would serve as a member of the House from 1873 until 1891. He would lose reelection in 1890 only to be reelected in 1892. His next time in the House lasted from 1893 until 1913. He returned for a third and final time in 1915 and would stay until 1922 when he refused to seek reelection. It was during his second time in the House of Representatives that Cannon became Speaker of the House. This was after three previous attempts were unsuccessful. Cannon ruled with an iron hand as Speaker. He took the sole power of deciding who would chair which committees and who would sit on those committees. He used that power to control members of his own party. On March 17th, 1910, St. Patrick's Day, Cannon came under fire when a group from his own party consisting of 49 Republicans joined forces with 149 Democrats joined forces to remove his powers from him. The vote was filibustered for 26 hours as people scrambled to get Cannon supporters back into the room. Unfortunately most of his supporters were Irish-American politicians and were involved in the St. Patrick's Day festivities. Eventually the bill passed and Cannon was left powerless. The following election Democrats took control of the House and he was replaced as Speaker of the House. On the last day of his last term in 1923, Cannon was featured on the first cover of Time Magazine. Cannon passed away on November 12th, 1926. Is is believed that Cannon joined Freemasonry in 1858. After that he was one of the founding members of Tuscola's Masonic Lodge No. 332 in Tuscola, Illinois. After that he affiliated with Olive Branch Lodge No. 38 in Danville, Illinois. He was also a member of Vermilion Chapter No. 82, Royal Arch Masons and Athelstan Commandery No. 45 of Knights Templar.